Teaching history off the page and making it a more interactive experience is a great way to engage children in what they are learning. It also gives them the opportunity to apply what they have learned in class in a fun and exciting way. 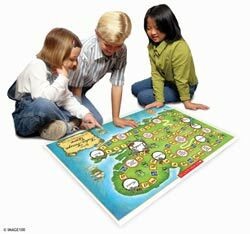 The A2 poster, ‘Ye Olde Tudor Troupe Game’ (see linked resources, below) is an entertaining, yet informative, board game based on Tudor history for Key Stage 2. Players take on the role of a Tudor troupe, which goes on a journey around southern and central England, travelling through towns such as Dover, Bristol, Gloucester, Cambridge, Stratford and Norwich, as they race against each other to London to put on a play at the Globe Theatre. The game’s activities are linked to life in the town and country, and refer to key points during the Tudor period. These include the dissolution of the monasteries, studies of Shakespeare’s plays, and the reigns of various Tudor kings and queens. By playing Ye Olde Tudor Troupe Game, children will develop their team-building skills, as well as their ability to add and subtract to deal with money they gain, spend or lose along the way! Children will need a basic understanding of the main events that took place during the Tudor period. Some knowledge of well-known personalities like Elizabeth I and Shakespeare would be useful. The key areas referred to on the board game are the dissolution of the monasteries, Kett’s Rebellion, the Spanish Armada, Henry VIII’s six wives, and the reigns of Henry VIII, Edward VI, Mary Tudor and Elizabeth I. Trade, town life and Tudor clothing are also mentioned. It would help to have available whatever Shakespeare play the class might currently be studying, or extracts from plays, as the children may be required to read a speech from a play.